Bike Metro suggested following the bike line on Glenoaks Blvd when I typed in a route to San Fernando. Great, except for one stretch where a vomitous stench threatens to blast you off the road. It turns out you're riding along a landfill, hidden by a tall hedge of shrubbery. Also, there are sections where the stripe is worn away, and motorists use the bike lane for parking and passing. Still, this is better than the remote, industrial, and sometimes traffic-filled route on San Fernando Road. I'm still looking for a better bike route. I'll keep you posted. Now for the good part. You know the benefits of bike exercise. You get to eat twice as much as normal people and still lose weight. Food is inextricably tied in with bicycle fitness. If you're in San Fernando before, after, or during a long ride, refuel at Dona Mercedes. (There's a squiggly "~" symbol over the 'n' in Dona, but I don't know how to write it using this software). Fresh-squeezed carrot and fruit juices to pump you full of antioxidants. Home made tortillas to give you fuel for the road. And lots of warm, greasy, proteinacious food to gladden your heart. Try their pupusas, that mostly go for about 2 dollars, depending on what you want in them. And their carrot juice rocks! Disclosure: I'm not in any way affiliated with Dona Mercedes, nor do I get any kind of commissions or special rewards if you eat there. I do have a weak spot for their stuffed chayote. Disclaimer: I am not a doctor, and any health claims about the benefits of biking, bicycle fitness, or the amount of calories burned while biking have not been evaluated by a competent medical authority. You should consult with a physician before engaging in long distance bike rides or pigging out on Salvadorean cuisine. We have eyelashes for days like this. From downtown to Vermont Avenue I never stopped squinting, as the Santa Ana wind pelted dust and leaves and shreds of paper and plastic from every direction. Eddies and miniature tornadoes flung litter into my spokes, and my teeth were chalky with grit by the time I got home. Riding in the rain can be a dangerous adventure, but riding in the wind is just sheer misery. I guess I could just wear goggles, look like a geek, but keep my vision. Or does anybody have a better solution? We're on a big nexus of "roads" that lead through early California, called the Royal Highway or El Camino Real. Most of the original route is covered by freeways now, but you can still get from mission to mission and sometimes city to city on paths and bikeways that are more or less faithful to the actual routes the missionaries took. Last Saturday I retraced a few segments of the old Mission Trail, from the San Gabriel Mission to LA to the San Fernando Mission. 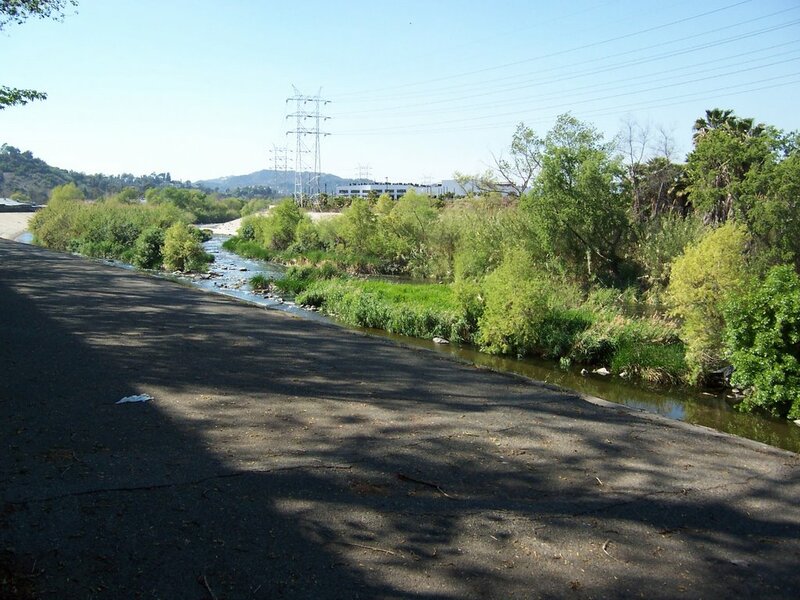 It mostly follows river paths along Arroyo Seco and the Los Angeles River. That makes sense because the "Pueblo" of Los Angeles was founded at the site where these two waterways merge. (Check out the photo). 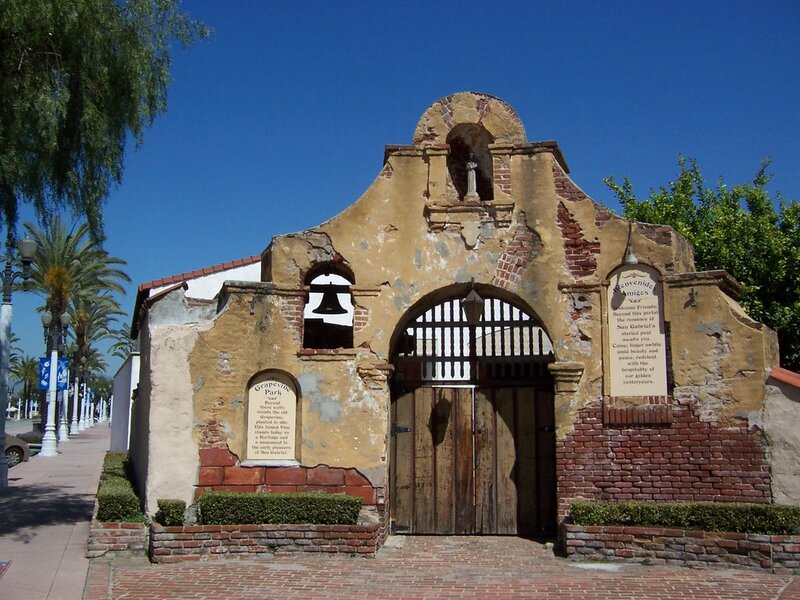 Plus the city was established by people from the San Gabriel mission, which was thriving because of the abundant water supplies. That's another thing about cars and pavement. Most people think of Los Angeles as a desert, but it was really teaming with shrubs and chaparral. The vegetation and soil acted like a giant sponge that held onto water from the rainy season and slowly released it during the long dry summer. Today all that water just runs off the pavement into the ocean, taking a lot of trash and oil and other stuff with it. Imagine if enough people traded their cars for bikes, shrinking their concrete footprints. Even if only 5% of us did it, couldn't that allow a lot of parking acreage to return to fields and gardens? Drop a comment or an email if you want to know the bike route to the missions. Eventually I'll take 3 weeks off and bike the whole Camino Real, from north of San Francisco down into Baja. Just a question: Does anyone else out there use their bike to study history?